Fall is my favorite season! Everything is pumpkin flavored, the leaves are beautiful, and you can walk around dressed like a clown and ask for free candy. Here are just a few fun crafts to celebrate the season! Our candy ladies will make up any excuse to bring in dessert! This entire scary scene is edible. 1. The bottom layer is one box of instant chocolate pudding mixed with one tub of whipped topping. We just used the instant kind, it’s fast, it’s simple, and when there is so many other great things going with it the quality isn’t a major issue for our sweet tooth! 2. The dirt is good old fashioned crushed up sandwich cookies. 3. Now the fun part! Decorating! This is where you can let the kids go crazy or make something really cute and ornate for a grown-up party. Don’t forget to buy extra ingredients if you like to taste test! 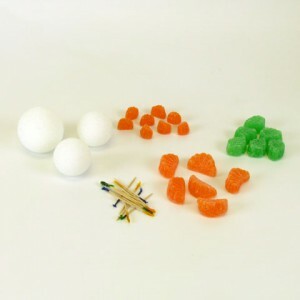 I’ll list what we used, of course everything can be purchased right here at OldTimeCandy.com! The scary tree is made from Black Licorice Twists. 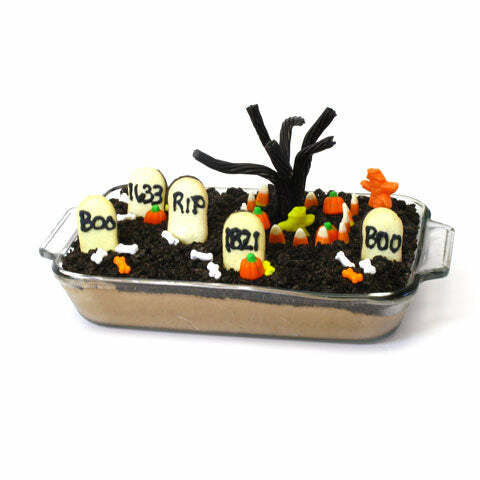 The gravestones are Milano Cookies with black icing writing. 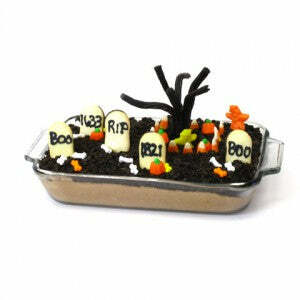 There is a candy corn fence and skeleton Bonz scattered near the headstones. Don’t forget the Gummi Scarecrow watching over everything! Simple and easy. Could be decorated with stickers, paint, or left plain. 1. 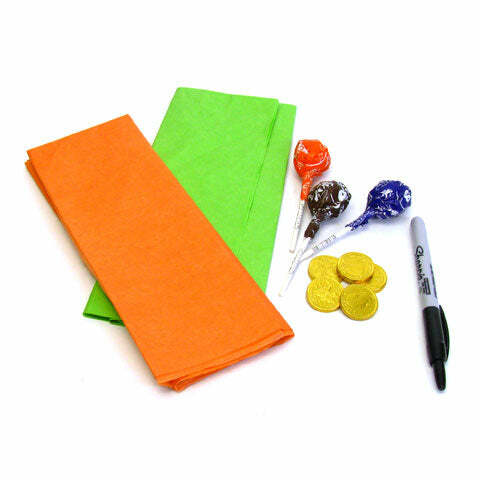 Cut pumpkin and leaf colored tissue paper into 6 inch by 6 inch squares. One square of each color for each pumpkin you need. 2. Put an orange square on the table and a green square on top of that. We then put a Chocolate Gold Coin centered in the middle. This isn’t a necessary step but it helps the finish product stand up straight! 3. Then take the Toostie Pop and place on top of the gold coin with the stick straight up. 4. Gather the tissue up and around the sucker to cover it. Wrap a pipe cleaner or ribbon around to tie it off and keep the tissue paper in place. This is also the stem! 5. 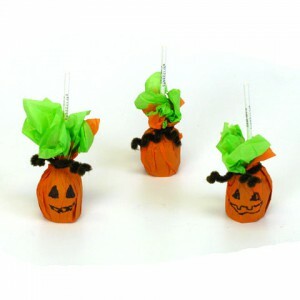 Decorate with a face for a Jack-O-Lantern or leave plain for a pumpkin. Such a cute little decoration or party favor. This craft takes a little bit of finesse and patience. 1. We found it much easier to start at the bottom of the pumpkin and work your way up. Placing a toothpick in the foam ball and then stick an orange slice onto the toothpick, work your way around the base in a “pumpkin shape”. 2. Depending on the size of your foam ball, continue step one with another row until you reach the top. 3. Using another toothpick, stick a Spearmint Leave or two on top for a leaf! A goofy treat great for a classroom or front desk. 1. Paint a flower pot. Simple. Just make sure you don’t paint it white. Your eyeballs in the next step won’t look nice if you use white! 2. After the paint is dry, glue on googly eyes. Use random sizes for the creepiest design! 3. Insert a piece of foam into the pot. 4. 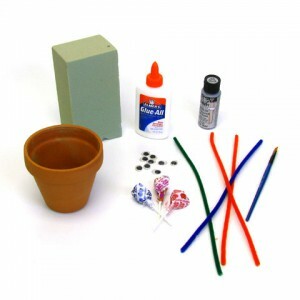 Arrange Dum Dum suckers into a bouquet. You can do even layers starting at the bottom or just stick them in at random. It’s your craft, not mine! 5. 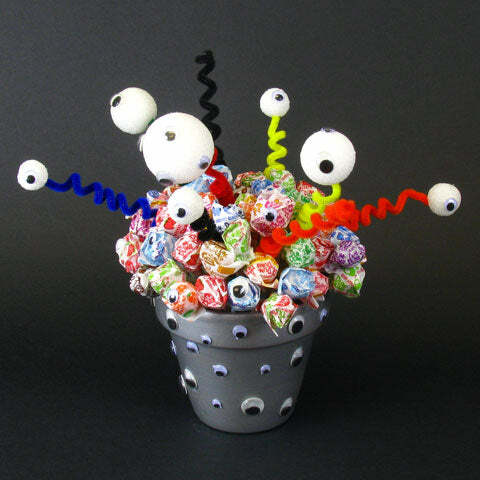 Attach foam balls to curled pipe cleaners and arrange throughout your bouquet. 6. Glue on even more googly eyes! I think this is what makes this so silly, enjoy it! 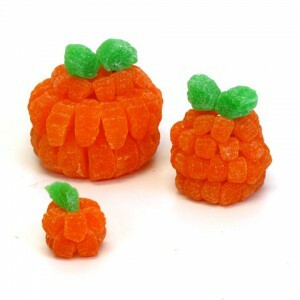 Do you use our candies and other products to make fun crafts? We want to see them! Share them with us on Social Media! Pinterest, Facebook, and Twitter.